Back-to-school season conjures up awesome memories of my sisters and me buying our school supplies that—of course—had to be color coordinated to our folders (Trapper Keepers) and notebooks. Do kids do that anymore? Anyway, back to school also means back to structured schedules, hurried mornings, and school lunches. A new school year not only holds promise for new opportunities for learning, but it’s also a fresh start to cultivate healthy food habits. We need to foster a culture of good health for our children. It is so important to teach kids from a young age to follow healthy eating patterns across their lifespans. Recent data from the CDC indicates that Americans, including children, are much heavier compared to 20 years ago. For example: girls are more than seven pounds heavier even though they are the same height. Boys gained an inch in height, but also packed on an additional 13.5 pounds. Being mindful of what we eat and drink supports a healthy body weight, nutrient adequacy, and the reduction of risk of chronic disease. Bring your children to the supermarket with you and teach them the different food groups; allow them to try a new healthy food or even plan the menu for their next lunch. The age of the child will dictate how involved they can be of course, but they can even help wash, stir, cut, or pack. I really believe it is never too early to start. My four-year-old plays an active role in our grocery shopping and prepping. It does get messy and drawn out, but when I find myself losing my patience because I am in a “perpetual rush,” she reminds me to slow down and enjoy the process because these activities teach lifelong good habits and provide us with quality time together. Keep it simple. It does not have to be fancy, unless you want it to be. There are so many creative and fun ways to pack a school lunch. (There are a million resources of ideas out there, but my focus is on nutrition here.) Overall, strive to provide a fruit, veggie, whole grain, lean protein, and healthy fats with every lunch. Keep portions in mind to encourage weight management. Here are just some ideas of our favorite food combinations. Just add some fruit and veggie to the meal and lunch is ready to go. Use your imagination, as the menu is limitless. I grew up where Spanakopita (Greek spinach-cheese pie) and Biftekia (Greek burgers), and peanut butter sandwiches were normal lunch items, so really just do what works well for you and your family while making good choices. Roasted fresh sliced turkey on whole wheat bread with romaine lettuce, Havarti cheese, tomato slices, and drizzle olive oil to moisten. Add a fresh apple. Half a whole wheat pita, filled with grilled chicken pieces, cucumbers, chopped red peppers, arugula (or any other vegetables to your liking), and topped with some Greek yogurt. Whole wheat wrap with black beans, avocado, corn, tomato, lettuce cheese with some salsa or Greek yogurt. An egg sandwich with green peppers or avocado slices or tomato slices on whole grain bread. Leftovers are a time saving option. Add a fruit, veggie, or some nuts, and you have a lunch. One example is wild salmon with broccoli and sweet potato from the night before; it doesn’t need to be complicated. Spread a peanut butter or any other favored nut butter on whole grain bread. Add a fruit and some raw veggies with a hummus dip. A salad with a colorful array of vegetables topped with a protein such as beans, lentils, salmon, tuna, chicken, turkey and a side container of olive oil and vinegar. Add a fruit along with whole grain cracker or bread. Some kids love oatmeal or soup. For example, your kids can help prep some overnight oats with their favorite fruit, nuts, and milk/or milk alternative combinations in a stainless thermos. Pasta is always a win with kids. Combine whole wheat bow or penne pasta with tomato sauce and some shredded cheese. Of course, avoid sugary drinks. Kids should drink water or non-fat or low-fat milk or milk alternatives. 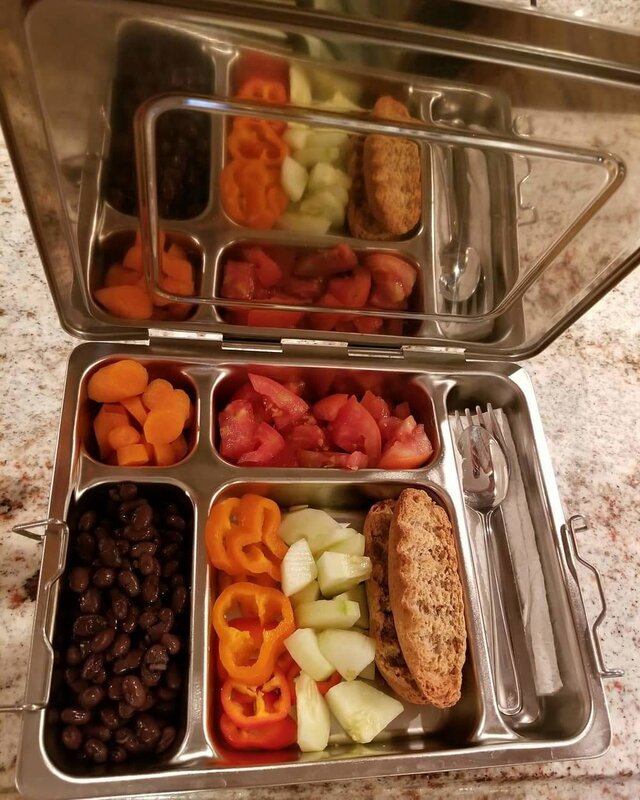 If your child doesn’t eat the lunch you pack, here are some suggestions from the Academy of Nutrition and Dietetics on how to deal with the four most common reasons: My Child Doesn't Eat the Lunch I Pack! What do I do? Most importantly, make smart choices to ensure safe school box lunches. What good is a healthy lunch, when food safety isn’t taken into consideration? Basic tips: keep things cool and clean. Ditch the brown bag; there are so many containers that are constructed to keep foods cool longer and prevent bacteria build up. Although a bit pricier, they may be worth the investment. When packing a lunch the night before, it helps to pack everything and store the lunchbox in the refrigerator overnight to keep the food cooler longer the next day. Here is a tip sheet for safe lunches for parents: Safe Lunch Study Guide. Lastly, if you need help in meal planning, food prep, and knowing what is nutritious for you and your family, I encourage you to see a dietitian in your area who can help you. My Child Doesn't Eat the Lunch I Pack! What do I do?